Bethany Mills has devoted herself to her young son James since her husband, unable to deal with a hearing impaired child, abandoned them when James was just over a year old. With the help of her parents, Bethany returned to college to earn a degree and teaching credentials. She left Memphis, Tennessee, to teach kindergarten in Hidden, Falls, California, hoping to build a life there for herself and her son. Bethany struggles not to be overprotective as she makes every effort to see that James enjoys the normal life of an active six-year-old. Her divorce has left her with trust issues, and she avoids any but the most superficial relationships. Grant McQuaid is a Hidden Falls golden boy, a local football hero who grew up to become an NFL star. Grant grew up on the family ranch, part of a large, lively family, but football has been his life from an early age. He is in Hidden Falls in the off season, concentrating on recovering from an injury that threatens to end his career prematurely. Grant refuses to accept the prevailing opinion of doctors and coaches that his days as a key player are over. Grant meets the beautiful Bethany and James, an avid football fan generally and a super fan of Grant McQuaid particularly, at a local park. He is immediately interested in Bethany, but her first impression of him is that he is an arrogant, privileged athlete accustomed to having whatever—and whomever—he wants. However, James is thrilled to meet his favorite football player, and Grant is charmed by “his biggest fan.” The two bond over football, and Grant’s ability to converse with James in the child’s preferred language, American Sign Language, is a big plus. Bethany’s initial wariness slowly disappears, and Grant captures her heart as well. But she is unprepared for the media attention that comes with being part of Grant’s life. Grant knows what he feels for Bethany is special, but he fears that with his career in jeopardy and his money invested in the family ranch, he has nothing to offer her and James. 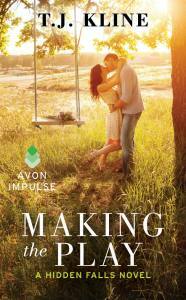 Making the Play introduces Kline’s Hidden Falls series. Bethany and Grant are likeable characters, and both her determination to protect her son and his struggles with an identity inextricably tied to his sport were believable. But it is James, all-boy and all heart-tugging sweetness, who makes this novel more than another entertaining sports romance. Grant’s family supplies interesting context and, with five brothers and a sister, offers the promise of more McQuaid stories. Readers who enjoy football romances should find this book appealing, as should fans of stories in which children have a pivotal role. This was my first book by Kline, but it will not be my last. I have noted that Dare to Fall, the second Hidden Falls book, will be released January 17, 2016. I love football so I would be interested in reading this book. Have added this to my wish list. That caught my attention too, Pamela!